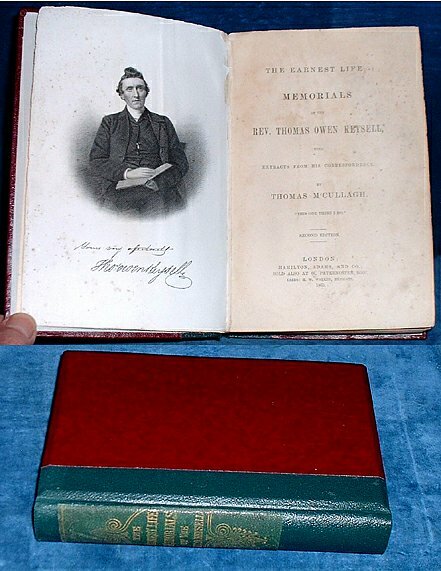 Title: THE EARNEST LIFE: MEMORIALS OF THE REV. THOMAS OWEN KEYSELL, with Extracts from his Correspondence. Second Edition. Description: London, Hamilton, Adams, and Co. 2nd edition 1865 Frontis portrait of Keysell. . Octavo newer cloth-spined boards with original title laid on (tips sl.rubbed) xi +348pp +4pp critical notices. Some light foxing/staining and about 6 corners turned down and creased. The portrait has some dust speckles which offset to the title. *Biography of Victorian Methodism especially in Leeds and the North. The book gives a good insight into the Wesleyan movement up to the 1860's. Scarce in the original printings as here.